TMZ reports that the Chicago rapper, born Keith Cozart, failed to show up in court to be arraigned for his DUI and weed possession case, resulting in a warrant being issued for his arrest. The "I Don't Like" hit maker was busted last month by the Miami Beach Police, during a traffic stop. Cops claim he was stopped because they allegedly witnessed a weed deal between a passenger in Keef's vehicle and another car. During a subsequent search, marijuana was found in the second vehicle. 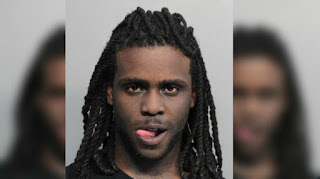 Keef allegedly told officers, "It's okay. When you find weed in my urine I'll just get my attorney to get my marijuana card." Keef was charged with felony DUI after failing a field sobriety test.